The time has finally rolled around for my last installment of the series I have been working on for quite a while now covering the major modern translations of the Septuagint. While there are other translations in progress (e.g., Japanese and I believe also modern Hebrew), there are four translations currently dominating scholarly discussion. These are the translations into English (NETS), French (BdA – Part I and Part II), Spanish (LBG), and German. So far we have discussed three out of the four with a view to understanding the differing methodologies involved in each project. At last, we have come to the German translation, known as the Septuaginta Deutsch, or LXX.D. 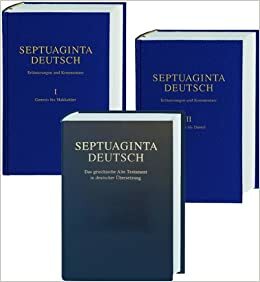 The Septuaginta Deutsch is published in three volumes by the German Bible Society (which, by the way, has a wonderful selection of online biblical texts freely available, including BHS, NA28, and Rahlfs-Hanhart). It is billed as the first complete German translation of the Septuagint, and was completed in 2009 after nine years of labor by eighty-seven scholars. The LXX.D is edited by Prof. Dr. Wolfgang Kraus (Koblenz) and Prof. Dr. Martin Karrer (Wuppertal), along with nine further co-editors. Like NETS, LXX.D is based upon the Göttingen Septuagint where available, otherwise defaulting to Rahlfs. The actual translation comprises two volumes, where there is also an apparatus detailing significant divergences from the Masoretic text, Greek variants, and alternative translation possibilities (into German). A third volume provides a commentary of the scholars who translated the Greek into German discussing their work. There is also an entire series of secondary literature volumes, referred to as LXX.E (here), compiling essays by scholars who were involved with the production of LXX.D. As if that were not enough secondary literature, there is also Das Septuaginta-Handbuch (LXX.H) forthcoming, which will furnish the scholarly world with a companion text parallel to the recent T&T Clark volume. With no fewer than eight volumes planned, however, the first of which is available this month, it is safe to say that the German handbook will go into somewhat more depth, more like a dictionary. Suffice it to say that the Germans have produced a lot of literature to get your head around. Unfortunately, unlike NETS or LBG, the LXX.D is quite expensive and best left to library acquisitions managers unless you are full-time into Septuagint scholarship. As Martin Karrer notes, since there was no precedent to a German translation of the LXX, the scholars involved were free to come up with their own principles (Karrer, 2008, 106). Consequently, Karrer points out the following characteristics of the German approach that guided their work. LXX.D understands itself first of all as a translation of a translation, thus gives priority to its own source text, i.e. the Septuagint itself. The translators “handed over their work to the readers … The available Greek became a source text in its own right” (ibid., 107). Because of its influence in lexicon and syntax, the Hebrew text is taken into consideration in the German translation, yet without giving it priority. Thus, LXX.D “allows strange and peculiar trends in German style (for example the foreign parataxis ‘und… und… und’) while real mistakes in the target language are not accepted” (ibid.). In sum, while most of the attention is paid to the Greek text in LXX.D, at least some weight is given to the Hebrew text as the translation was produced. Subservient to the previous goal, LXX.D employs the best critical editions of the reconstructed Old Greek version, rather than adopting the readings of a given later manuscript tradition (as does the Brill LXX commentary series). The obvious option here is the Göttingen Septuagint, although it is unfinished and therefore Rahlfs-Hanhart must fill in the gaps. Wherever the two differ, Rahlfs is rendered in a footnote, occasionally with commentary. Notably, LXX.D has declined to use Rahlfs’ in the Historical Books and instead adopts Fernández Marcos’ reconstructed Antiochene text. The rationale here is the highly complex textual history of the Historical Books due and the developments since Rahlfs put together his edition. In good German fashion, the LXX.D had strict protocols for work flow to produce “scientific reliability” in their translation (ibid., 109). Other features of the translation process included a team of researchers from multiple disciplines outside biblical studies, the addition of inner-Septuagintal cross references and general introductions to each book, and two full-blown conferences to discuss issues. Karrer summarizes the LXX.D approach to representing translation technique by pointing to the use of a concordance for translation equivalents between Greek and German for consistency, particularly where there are points of intertextuality within the Septuagint. Secondly, for readability LXX.D used a “system of reduced transcription” for transliterated words in Greek, normalizing the most common proper nouns (ibid., 112). Also, LXX.D has refrained from capitulating in its translation to contemporary cultural issues such as social justice or gender concerns, because of its devotion to the Greek rendering. That is not to say, however, that the exegetical realizations of Hellenistic culture within the Greek text are not conveyed into German. LXX.D is aimed primarily at researchers and graduate students and aimed at religious neutrality, while presuming readers to be biblically well-educated (ibid., 114). This certainly comprises German-speaking Eastern Orthodox Christians, although there are often textual differences with liturgical materials employed in (often differing) Orthodox rites. Both NETS and BdA existed prior to LXX.D, and thus the latter was developed with the benefit of preexisting methodological reflection upon translation translation, so to speak. However, there are a few key differences. LXX.D, unlike NETS, does not use an existing translation of the Hebrew OT as a base text that is changed wherever the Septuagint diverges from it (ibid., 117). In part this is because NETS takes the Hebrew text as its point of departure in important ways that legitimate such a decision. LXX.D is not interested in interlinearity. LXX.D is also less interested in reception history than BdA, although it is not completely disregarded in producing the German version in difficult texts. It is arguable that the middle two could swap places, but in my reading of LBG I see more discussion of the legitimacy of the Greek Septuagint as an independent text than LXX.D. As far as I can tell, LBG will consult the Hebrew text to clarify where “necessary,” while LXX.D consults the Hebrew text as long as it does not have priority. Thus the differences, I think, is in degree. This series has been a long time in the making, and no doubt much more could be said. Accordingly, for those interested, I presented a bulked-up version of this series in paper format at the ETS National conference in Atlanta, GA, which I hope to publish eventually. While the paper won’t be “more” in length than this blog series, it will include more comprehensive notes to secondary literature that will hopefully be a guide through these important issues in the discipline. Karrer, Martin. “Septuaginta Deutsch (LXX.D). Characteristics of the German Translation Project.” Pages 105-18 in Translating a Translation. Edited by H. Ausloos, J. Cook, F. García Martínez, B. Lemmelijn and M. Vervenne. Bibliotheca Ephemeridum Theologicarum Lovaniensium 213. Leuven: Peeters, 2008. It has become one of my favorite tasks for this site to put together a post for my Septuagint Scholar Interview series. It’s always a pleasure to learn more about others who have been active in the field for some time. We are now on the fourth installment, and if you pop over to the interview page using that link up there, you’ll see that I have a few others lined up that should be interesting reading. But today we have a great interview with a real, live Septuagint scholar, Dr. W. Edward Glenny. I met Ed several years ago at an IOSCS session at the SBL national meeting, and we have gotten to know each other through that venue ever since. Ed and his wife also spent several months at Tyndale House, Cambridge, where I conduct my research, so he has become a good friend. He is also a fellow member of the steering committee for the brand new Septuagint Studies session at the annual ETS national conference. For the past four years Ed has been the endowed professor of New Testament Studies and Greek at the University of Northwestern, St. Paul. He is one of those rare breeds that holds not one, but two doctoral degrees, both Th.D. from Dallas Theological Seminary and Ph.D. from the University of Minnesota (as you’ll read about below). As you can see by flipping over to his faculty page, Ed has a long list of academic publications, many of which are related to the Septuagint, especially his focus area, the Twelve. Without further delays, let’s hear from Ed. 1) Can you describe how you first became interested in LXX studies, and your training in the discipline? My first contact with the LXX was through a class on the LXX with Allen Ross during my doctoral program at Dallas Seminary. I audited the course with Dr. Ross, and it was partly because of that course that I wanted to write a dissertation on the use of the OT in the NT for my doctoral program at Dallas. I began to use the LXX in my dissertation at Dallas on the use of the OT in 1 Peter. After I finished that project I felt like I wanted to learn more and improve my language skills further, so I enrolled in a graduate program in classics at the University of Minnesota. I majored in Greek, and my second ancient language was Hebrew. So, with my emphasis on those two languages the LXX was a natural topic for my dissertation at Minnesota, and I wrote on the translation technique in LXX-Amos. 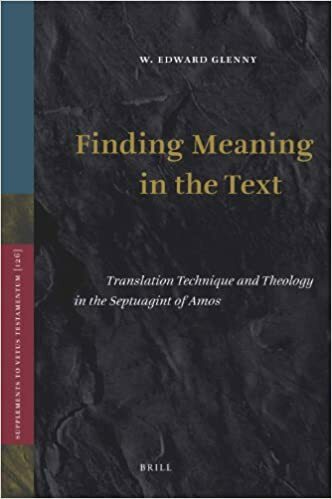 That dissertation was published in Brill’s Supplement to Vetus Testamentum series (Finding Meaning in the Text: Translation Technique and Theology in the Septuagint of Amos), and it was really my entry into LXX studies. I was able to spend time at Tyndale House at Cambridge University while I was researching and writing my dissertation on the LXX, and Robert Gordon and some of his students who were working in the LXX were a great encouragement and help to me in my work. I have presented papers in the IOSCS section at the annual SBL meetings, and I have also presented at the triennial international meetings of the IOSCS. I have also had the privilege to write several book reviews, articles, and books on the LXX. 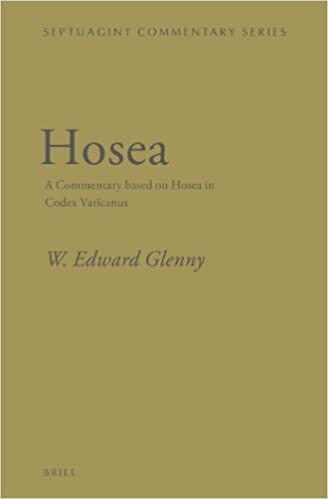 In addition to my dissertation I have published three commentaries in Brill’s Septuagint Commentary series, the commentaries on Hosea, Amos, and Micah. Among other articles, I contributed the article on the Introduction to the Twelve in the LXX in Brill’s forthcoming work The Textual History of the Bible. 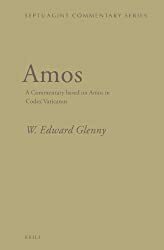 In the days ahead I am looking forward to writing several other volumes for Brill’s Septuagint Commentary series, as well as a handbook on the LXX of Amos for Baylor University Press. I think that I can give a general answer to this question. The field is becoming more sophisticated and complex, and scholars continue to build on the work of previous generations and go to greater levels of depth in the study of the LXX text. Continued study has resulted in more comparison of the LXX with other contemporary literature and with more detailed studies of the Septuagint itself. LXX studies in doctoral work, what in your opinion are underworked areas and topics in need of further research? I think that the area of translation technique is one of the most important areas of research that will continue to provide opportunities for work in the LXX for years to come. This is because the study of translation technique is wide-ranging and complex and can be applied to a LXX text in many different ways. My main LXX project right now is a review of the T&T Clark Companion to the Septuagint, edited by James K. Aitken. 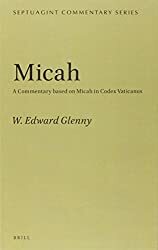 I published a commentary on LXX-Micah in early 2015, and now my main project is a New Testament commentary (1 Peter). But as I mentioned above I am looking forward to working in earnest on the LXX again in a year or so. The future of Septuagint studies is very bright! There are many young scholars working in this area, and previous generations of scholars have provided them with some excellent tools to use in their studies and more LXX resources and studies are being published every year. I anticipate that the field will continue to grow and flourish. Thanks to Ed for being willing to answer these questions! As I mentioned, stay tuned for further interviews in the near future. If you have a suggestion for a later interviewee, or a question you’d like to see added, please let me know in the comments. Today I wanted to focus on something that I mentioned back in my Spring Update post quite a while back. (If you’ve published in academic journals then you know how long it can take for these things to finally surface in print.) I am pleased to have had an article accepted in Zeitschrift für die alttestamentliche Wissenschaft, or simply ZAW for those less inclined to pronounce long German phrases. The journal is published quarterly, and my piece will be in the upcoming September issue (127/3). According to their website, ZAW “has been the leading international and interconfessional periodical in the field of research in the Old Testament and Early Judaism for over one hundred years.” Needless to say, it is an honor to have my own work included in this journal. My article is entitled “Text-Critical Question Begging in Nahum 1,2-8: Re-evaluating the Evidence and Arguments.” In it, I examine the text of Nahum 1, where many scholars have drawn attention to what is almost an acrostic (in the Hebrew text). There are a few letters missing, namely daleth, zayin, and yod lines, and so it is fairly common in critical commentaries for scholars to suggest various ways of emending the Hebrew text in order to “restore” the acrostic to its supposed proto-form. While this may sound somewhat reasonable, this near acrostic is also, admittedly, a partial acrostic. This means that it only spans part of the alphabet (just the first half) even in its theoretical “original” form. In my view, that makes the whole assumption that it is, in fact, supposed to be an acrostic, much more speculative and therefore suspect. So what I do is examine each of the three places where there is a “wrong” letter and where emendations are usually proposed. I summarize common arguments for altering the Hebrew text in a way that “restores” the acrostic. For the most part these must build on versional information (mainly the Septuagint, but also Latin and the Peshitta), since there are no proper variants in the extant Hebrew manuscript tradition. Then, I examine the text of the acrostic in the Old Greek version of Nahum (Zeigler’s text) to evaluate the translation technique that characterizes that unit of the book (1:2-8). I show that the divergences in the Greek version from the Hebrew MT are better accounted for as features resulting from the process of translation rather than a different Vorlage, namely one that contained the theoretical “acrostic.” Finally, I martial the results of other scholars’ studies conducted in the LXX-Twelve Prophets, which is thought to have been translated by a single individual, to demonstrate how their characterization of the translation technique of the entire Twelve further corroborates the translational and textual trends present in LXX-Nahum 1:2-8 (and therefore my argument against a different Hebrew Vorlage). I don’t see any acrostic on that scroll, do you? When it comes to the so-called “acrostic” of Nahum 1:2-8, I find it much more interesting and exegetically rewarding to reckon with the possible reasons that the text is, in fact, nearly an acrostic … but not quite. I believe Tremper Longman’s view is fairly satisfactory here as he takes a literary critical approach: in the context, the judgement and wrath of the Lord brings upheaval upon all of creation to such a massive extent that even the very text involved in describing it is jarred and disrupted. * To me this approach to the text of Nahum 1 rightly expects much of the literary capabilities of biblical authors, and of the competence and meticulousness of later scribes. Unfortunately, I can’t distribute the article itself in PDF form. But you can find it shortly in the forthcoming ZAW. *Tremper Longman, “Nahum,” in The Minor Prophets: An Exegetical and Expository Commentary, ed. Thomas E. McComiskey (Grand Rapids: Baker Academic, 2009): 765–830.